Different assignments were given to the students so that they can get hands on experience on different materials and processes. 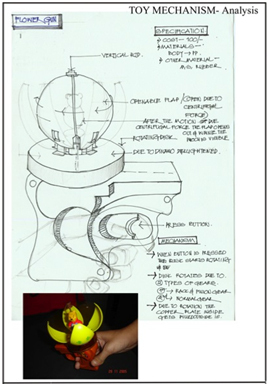 The assignments were to first dismantle a simple toy and study the components. 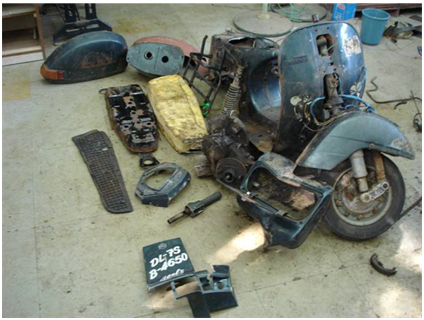 Thereafter three different brands of two-wheelers were disassembled and studied. 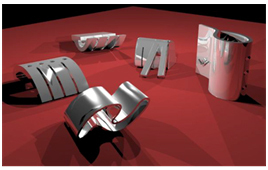 Next the students designed various products to be manufactured using stainless steel. 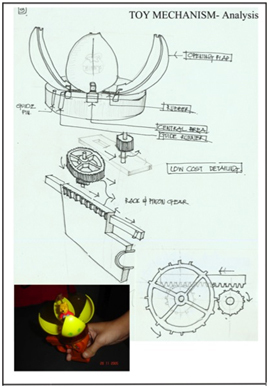 Last assignment was to search for exemplary products that have achieved their strength through an intelligent use of materials and processes. The students chose simple toys. 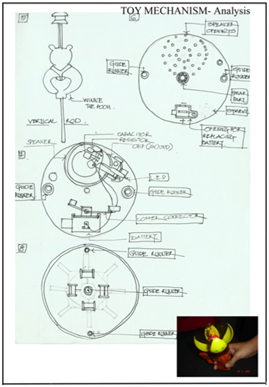 The toys had minimum mechanism, and thus the details, materials and processes could be given appropriate importance. 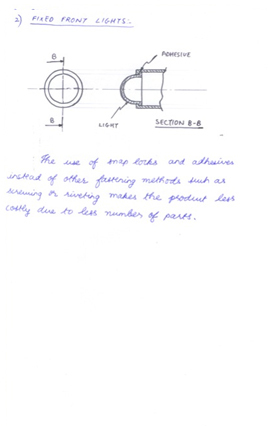 A much better understanding of basic materials and processes was garnered through this exercise. This was especially true in case of plastic as a material since most of the toys today are made in cheap plastic, usually polypropylene or polyethylene. 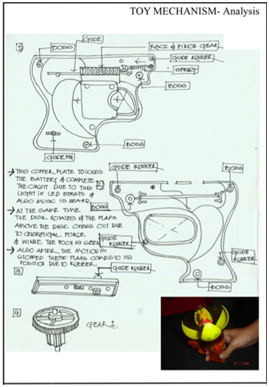 Thus, basic techniques of plastics, like bosses, fillets, ribs, screw fitting, press fitting etc were understood. Also, basic mechanisms for converting one form of energy into another were studied. 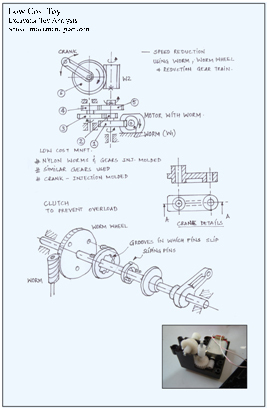 Springs were the basic component in most of these mechanisms. Spiral Springs, coil springs, helical springs were thus comprehended. 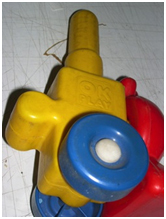 A very cost effective method of manufacturing was seen, as the toy industry is very competitive. 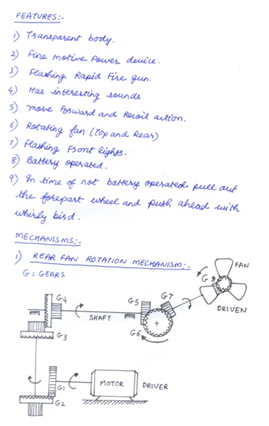 Following images show the key findings of the assignment. 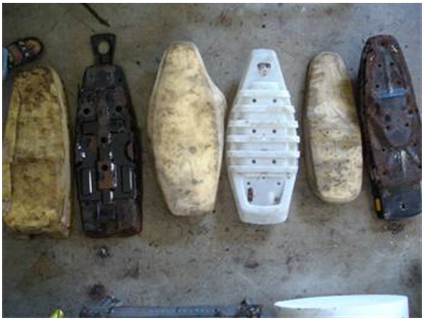 The Seats of Vespa and Hero Puch were deep drawn whereas the seat of Scooty is injection molded.The foam in each case, which is used to give comfort, is heated and molded. 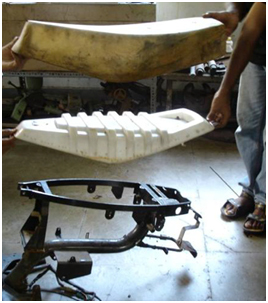 The TVS Scooty has a chassis, which is made of sections welded and bolted together. The body of the Hero Puch is constructed from sheet metal welded together whereas the body of LML Vespa is essentially a monocoque structure. 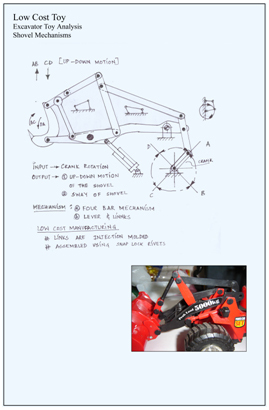 The various components are welded to the chassis by arc welding. 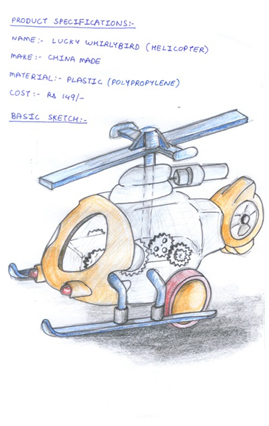 The engine is attached to the body using an axial bolt and nut in each case. 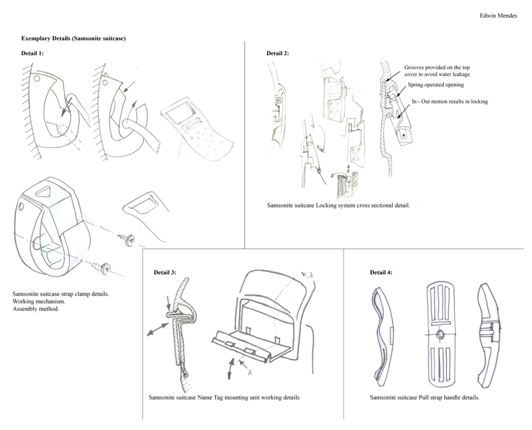 In parts where maintenance is required during use, removable fastenings are used. 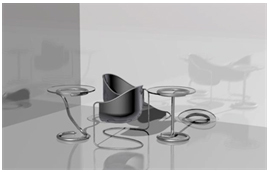 Successful products display an exemplary use of materials and details in their design. 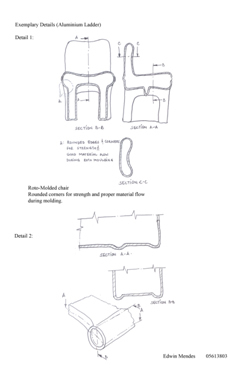 Such products were studied to understand how different materials were used to satisfy the product requirements. 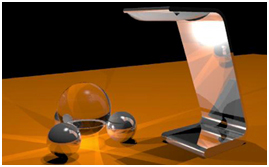 It was also observed how small additions of other materialscould play a vital role for the success of the product. 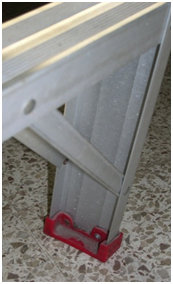 The side supports of this ladder are made from extruded aluminum sections. They are shaped in such a way to improve the strength of the sections. The rungs of the ladder are also extruded sections. They are provided with ribs. 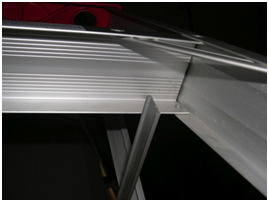 The cost of the ladder drops down considerably since most of the construction is of extruded aluminum. 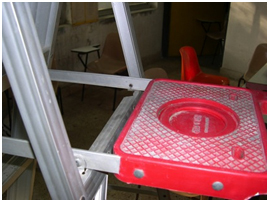 The top of the ladder, the platform as well as the bottom pads is made of injection-mouldedpolypropylene. 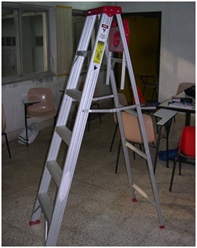 It not only provides a soft padding, but also adds to the aesthetic appeal of the ladder by giving it a touch of color. The top has conveniently placed holes for hanging tools or brushes. The platform has been joined to the aluminum section by simply making a cut in it and bending the aluminum to make a hinge with the help of a rivet. 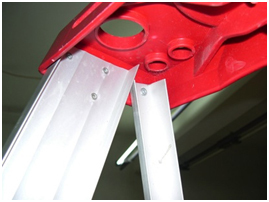 The top and bottom rung are provided with extra support as seen in the photograph. Rivets do the fastening in all cases. The rivets are rounded off at the inside so that there are no flared sharp ends to harm the aluminum or the plastic. 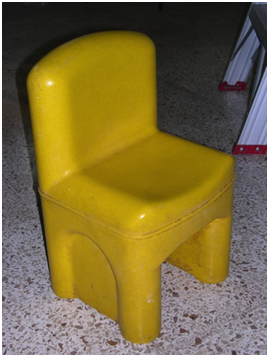 This chair is made of polyethylene, a very conducive material for rotomoulding and blow molding. 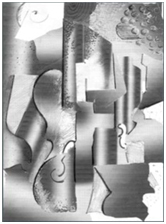 Polyethylene flows easily and doesn‘t cool too quickly, thus enabling complex shapes to be made in roto and blow molding processes. The parting line is taken such that it comes on the ridge of the seat, thus hiding the parting line. The ridges at the bottom of the seat and the base of the legs are provided for extra support and strength. 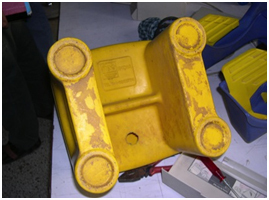 The individual blocks on the train are made or blow molded polyethylene. The kind of locking between two blocks used here is very easily achieved in blow molding, since the part itself is slightly compressible by virtue of it being filled with air. 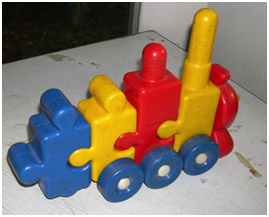 The wheels of the train are injection-molded polypropylene. They have ribs and a hub to give it more rigidity. 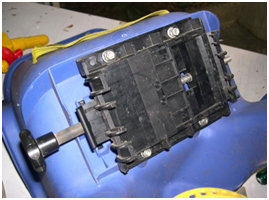 The seat is made from polypropylene by injection molding. 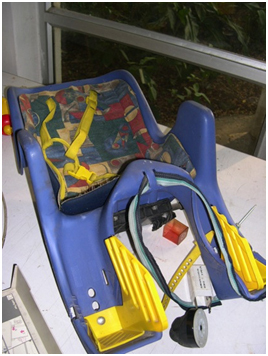 Since safety is the main issue in this case, there are numerous belts and clasps provided on the seat. 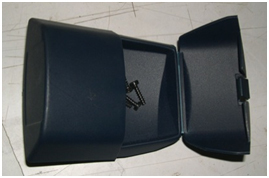 The seating is on a removable foam seat for added comfort and is joined to the plastic seat with Velcro. The part where the seat will get attached to the bicycle is made of nylon and has a double locking mechanism. 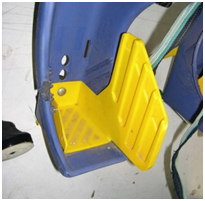 The leg guards are made from soft polypropylene for comfort and joined to the main seat with the help of rivets. The injection-molded seat is given broad radii protruding lips at the arms aiming at increasing strength as well as comfort. There are no ribs provided at the base of the back, which caused the plastic at the joint there to be stressed due to fatigue. e.
The suitcase is made of injection-moldedpolyethylene, which is an excellent material for injection molding.The wheels have nylon bearings inside them. This gives them rotational as well as rolling motion, making it easier to pull the suitcase. 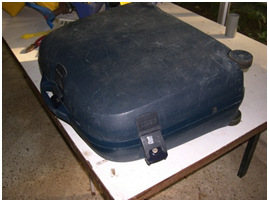 The various fittings on the suitcase are also injection molded, either in polypropylene or polyethylene. 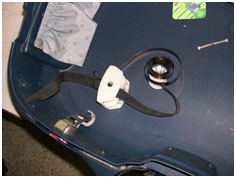 The cord for pulling the suitcase is joined to a coil spring. 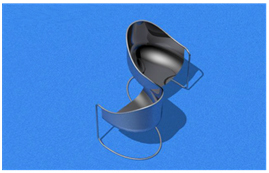 The entire spring mechanism is encased in a chamber made of polypropylene with a live hinge. The two parts of the suitcase fit each other in a special groove made in the bottom half. This two-wheeled scooter is made mostly from aluminum. The handle is made of aluminum pipes with a cross-section, which enables the two parts to be assembled in only one orientation. 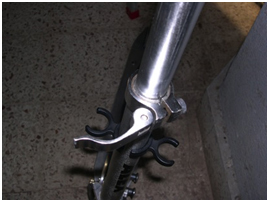 The fork between the handle and the handlebars is made of pressure die cast aluminum. The handlebars are pipes with foam grips, which are extrusion molded. 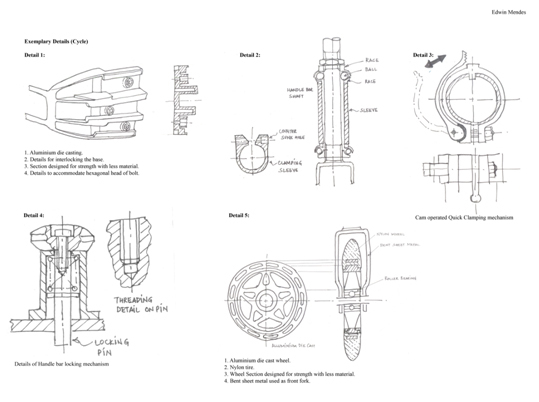 The fixing mechanism is a spring-loaded button, which snaps into holes provided on the fork. 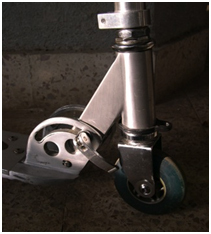 The rod, which connects the handlebar to the wheel fork, is made of extruded aluminum sections. The cross section of these is as shown. They slide into each other, thus enabling the length of the rod to be adjusted. 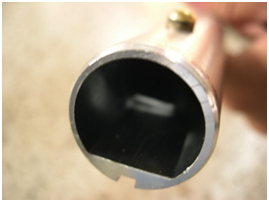 The part, which tightens the rod at its extreme position, is a lever with a cam profile at one end. 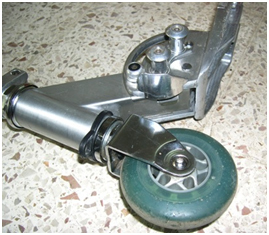 The rod can thus be extended when needed and retracted when the scooter needs to be folded and stored. 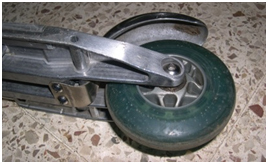 The wheels are made of nylon for minimum friction. The front wheel is attached to a fork. Since this fork takes a large amount of stress, it is made of steel with a brushed finish. The back wheel has a brake attached to it. 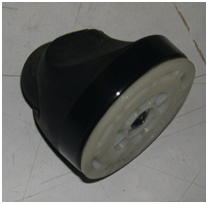 The brake consists of a metal mudguard with a helical spring. 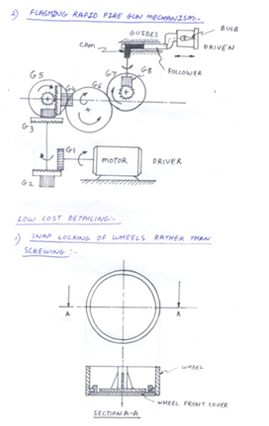 To apply the brake the metal part is simply depressed causing friction with the wheel. 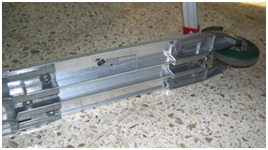 The base is made of a central extruded aluminum section. At both sides it is capped by pressure die cast aluminum parts. These cast parts are provided with two levels so that the base level of the platform remains constant even after joining. 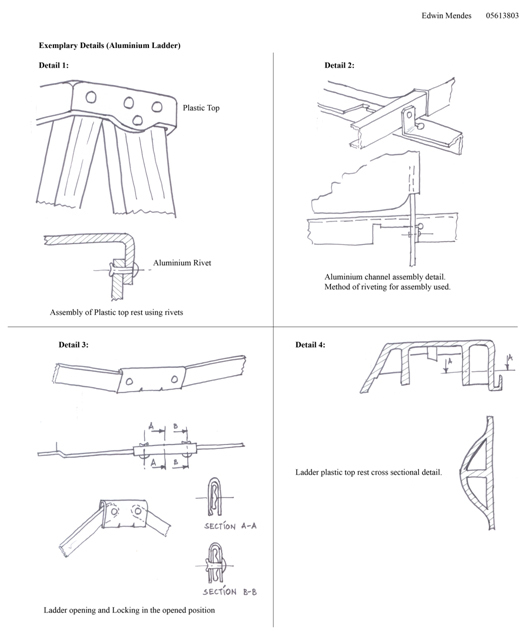 Fastening is mainly done with nut-bolts.